Choosing the right size wakeboard is important to assist your ride. The size of your wakeboard depends on your weight and riding style. 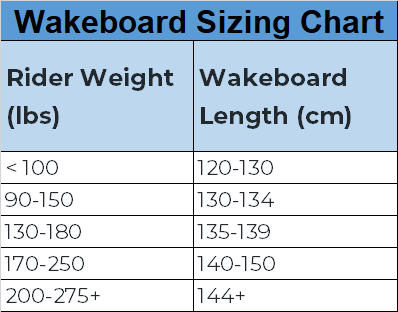 Sizing guidelines are not the same for every wakeboard and each one will have its own specific guidelines based on riders’ weight. You should consider if multiple people will be using the same board to have one that will meet everyone’s needs. Your board provides a decent amount of buoyancy and having a longer board will ensure you are floating. You should also consider your board shape as different shapes can affect your ride. More advanced riders often like to ride on a board that is on the shorten end of their suggested size range. Having a shorter board can help a rider with some of their tricks. A shorter board is easier to spin and move in the air. Landings are much harder the smaller your board is, as there is less surface area for you to stick your landing. Longer boards are great for beginners and for teaching people how to ride for the first time. Having a longer board gives you more surface area and will help with landings. Having control is easier and is great if you are learning a new trick or trying to get up for the first time. It is more difficult to do aerials as your board is heavier and less aerodynamic in the air.